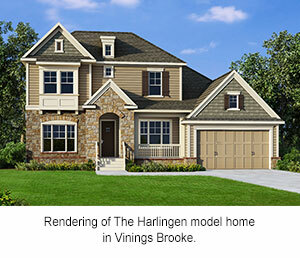 ATLANTA, GA (September 9, 2015): David Weekley Homes will open its new model home, The Harlingen, in the community of Vinings Brooke during its Grand Opening weekend set for September 12-13 from 1-4 p.m. The Harlingen is a two-story home with 3,769 square feet of living space. This open-concept floor plan includes four bedrooms, four full baths, one half bath, media room and bonus room. Other special features include a two-story family room, guest suite on the first floor, Owner’s Retreat with sitting area, super shower and walk-in closet. The home also includes an outdoor living space. Four showcase homes are also under construction and are expected to be complete by the end of the year. The two-story Vanburen, located at 5401 Bluestone Circle, is priced at $533,122 and features 3,587 square feet with four bedrooms, three full baths, one half bath and two-car car garage. This home will be ready for move-in in November. The second showcase home, The Harlingen, is a two-story home with five bedrooms, four full baths, one half bath and a three-car garage. Priced at $607,753, this 3,174 square foot home is located at 5398 Bluestone Circle and will be ready for move-in in November. Also ready in November will be The Crandell. This three-story home features four bedrooms, four full baths and a three-car garage. Located at 5404 Bluestone Circle, this home is 3,732 square feet and is priced at $615,062. Lastly, The Sadler will be ready for move-in in December and is a two-story home with four bedrooms, three full baths and a three-car garage. Priced at $566,490, this 3,146 square foot home is located at 5302 Bluestone Circle. Homes in Vinings Brooke are priced from the $450s and range in size from 2,700 – 3,700 square feet with one- and two-story homes available. Residents have access to activities such as biking, hiking skating and skateboarding at the 61.5-mile Silver Comet trail. Vinings Brooke is conveniently located to Dobbins Air Force Base and Lockheed Martin Aeronautical Plant and Home Depot headquarters. There are also a number of private schools located near the community, including Whitefield Academy. The model home is located at 5416 Bluestone Circle in Mableton and is open daily for tours. For more information about Vinings Brooke, homebuyers can call 404-481-3906.